Abner Pratt was born on May 22, 1801, at Springfield, Otsego County, New York. He had no formal schooling but eventually read law at Batavia, New York, later practicing in Rochester, New York, as District Attorney. He liked what he saw of Michigan on a business trip in 1839, and resigned his post in New York to move to Marshall, Michigan. At first he practiced with a Judge Lee, but shortly thereafter went into partnership with Judge Isaac E. Crary. 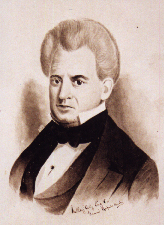 In 1844 Pratt was elected State Senator from the Fourth District, and in 1850, was appointed to the Michigan Supreme Court to succeed Justice George Miles. Under the new Constitution of 1850, he was elected Circuit Judge and Justice of the Michigan Supreme Court for a term of six years. Pratt resigned from the Bench in 1857, when President James Buchanan appointed him Consul to the Sandwich Islands, with headquarters in Honolulu, a post he held until 1862. It was this tour of duty as Hawaiian Consul that enabled Pratt to contribute what is probably the most tangible of his legacies to Michigan. In the early 1860s he built, near the center of Marshall, a beautiful home which came to be called the “Honolulu House.” In a city of many lovely historic buildings, this one became the home of the Marshall Historical Society and may be toured by the public. It was this same tour of duty that contributed to Pratt’s rather unexpected early death. He had suffered from asthma most of his life, but living in Hawaii apparently caused the condition to worsen. He died on March 27, 1863, only a few weeks after being elected to the Michigan Legislature as a representative from Calhoun County.